Abcam's Methylated DNA Quantification Kit (Fluorometric) (ab117129) is a complete set of optimized buffers and reagents to quantify global DNA methylation by specifically measuring levels of 5-methylcytosine (5-mC) in a microplate-based format. It can be paired to use with Hydroxymethylated DNA Quantification Kit (Fluorometric) (ab117131), which specifically quantifies 5-hmC, for simultaneously quantification of both methylated and hydroxymethylated DNA. Demonstration of high sensitivity and specificity of methylated DNA detection achieved using ab117129. Synthetic unmethylated DNA (contains 50% of cytosine) and methylated DNA (contains 50% of 5-methylcytosine) were added into the assay wells at different concentrations and then measured with ab117129. Publishing research using ab117129? Please let us know so that we can cite the reference in this datasheet. I usually use molecular techniques for global methylation (LUMA, etc.) but wanted to give this kit a try since I was hoping it would be easier. Yes, the assay can be done in a day but it's somewhat clunky and has many many steps. You're out of luck if you don't have a multichannel pipette since there are alot of incubation/wash steps... Also, I wasn't too happy with my standard curve. In brief, perhaps this is good if you're new to methylation assays, but if you know how to measure methylation without a kit, it might actually be easier. The controls with known concentrations had inconclusive signals and even my sample had a bigger signal in the well with the lowest quantity of DNA. We read the plate using two different plate readers and in none of them it worked properly. After that we also removed the Fluoro-Development Solution from the wells and we added more 10microL of this solution to try to get a correct signal but this also did not work (in this measurement the signal of the negative control was bigger than all the others). What do you think that could be the problem and how can we have correct results? Having reviewed this case with the lab, I would like to offer some suggestions to help optimize the results from ab117129. 2) too much time between adding Fluoro-Development Solution and reading the plate. 2) reduce the color development time after adding the Fluoro-Development Solution. The color development is continuous and cannot be stopped therefore after some time the signal will reach plateau for all of the wells. In general, the best time for measuring fluorescence should be 2-3 min after adding Fluoro-Development Solution, or based on the color change. When a slight pink color is seen in the wells containing the highest amount of the positive control and the blank well is still clear, the measurement should be carried out. Hello, I received this query via Facebook, and would like to know how best to answer it? Any help is much appreciated. · I got the episeeker methylated DNA Quantification and would like to know the constitution of TE buffer specified in protocol. Thank you for your enquiry and interest regarding ab117129. I can confirm that the TE buffer specified in the protocol is constituted with 10 mM Tris-HCl pH 7.5-8 and 1 mM EDTA. Does the assaydetect single strand DNA or double strand DNA? If both, is it more sensitive for detection of methylated single or double stranded? 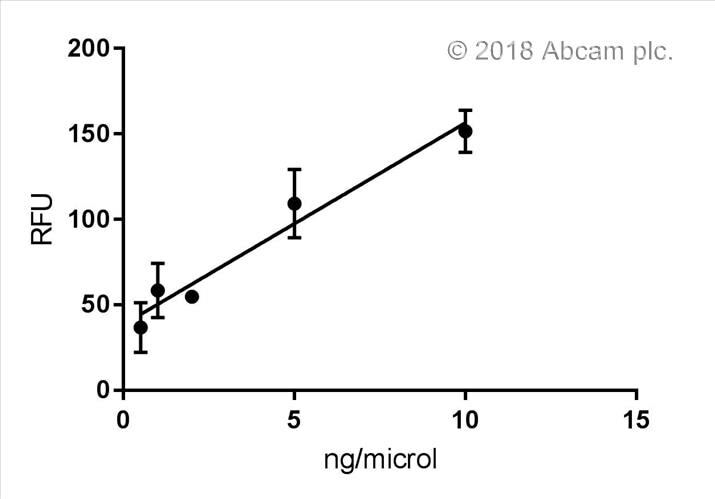 Yes, the assay detect 5-mC on both single and double stranded DNA with the nearly same sensitivity. The standard is double stranded DNA. Thank you very much for your help. It is good to know that the excitation wavelength was fine. However, we decided to stop working with these assays – at least for the moment. I appreciate the time you have spent but would it be possible to go for a refund, like your colleague wrote? Your credit note ID is ******. Both assays I performed with the standard curve prepared according to the respective manual but I saw inconsistencies in these curves. Some values in that dilution series absolutely do not fit (while others are ok) and in some cases even the replicate values differ strongly. The replicates of my samples differ as well - in some cases up to 30%. I measured with Ex/Em 550/595 nm. Apart from that I strictly followed the manual. Do you have any ideas or hints? We have now received the stimulation graph from the laboratory. Please find it in the attachment. Based on that graph, I am happy to confirm that stimulation at 550nm is absolutely fine, as well as emission reading at 595nm.I hope this information is helpful and does reassure you. In regards to the inconsistency in your results, I would be pleased to investigate this further. Can you therefore please send me the raw annotated data as well as detailled information on the samples andtheir preparation? Often inconsistency in duplicates are due to technical problems, such as unsufficient washing, bubbles in the well orsmall pipetting difference.I will however be pleasedto look into this problem further with the helpof the data from you. I look forward to hear back from you. Thank you for your cooperation. I would like to inform you that we are still investigating the problem you experienced with the kits. The lab has already provided the following information: "The reading can be carried out at 530/590 nm +/- 10 generally. Thus, emission at 595 nm is fine, and excitation at 550 may be Ok but suboptimal". From this Claudiarequested a graph of the excitiation and emission of the fluorochrome used in the kits and we are still waiting for more details. I have sent a reminder to the lab, we are very sorry we cannot still answer this question and I hope we will be able to do so within the next couple of days. I appreciate the time you have spent on these experiments and would be pleased to arrange a replacement, a refund or credit note in compensation.As a replacement, please note thatthe only lots (for both kits)we currently have in stock are the same as the ones your received, let me know if you would like to receivefree of charge replacements and I will ask the source of the kits ifalternative lotsare available.